Annulus: The region between two concentric circles. What is the difference between an annulus and a circle? Manipulative 1 - Annulus Created with GeoGebra. An annulus is the region between two concentric circles. The area of the annulus is the difference between the areas of the circles: A = π(r12 - r22) where r1 > r2. What is the area of an annulus with an inner radius of 1m and an outer radius of 3m? Answer: The formula for the area of an annulus is A = π(r12 - r22), r1 > r2. Plugging in 3m for r1 and 1m for r2, we get A = π(32-12) = π(9-1) = π·8 ≈ 25.13. Figure 4: Pipe. 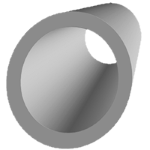 The cross section of a pipe is an annulus. 1. A pipe has an inner radius of 3 cm. It has an outer radius of 3.5 cm. It is 100 cm long. What is the total volume of the pipe, not including the empty space inside? Hint: The volume of a cylinder is equal to the area of the base times the height of the cylinder (V = b·h). If the base is an annulus, what is the volume of the pipe? Answer: The volume of a pipe is the area of the base of the pipe times the height. The area of the base is A = π(r12 - r22), r1 > r2. So A = π((3.5 cm)2-(3 cm)2) ≈ 3.14159(12.25cm2 - 9cm2) ≈ 3.14159·3.25 cm2 ≈ 10.21 cm2. The volume of the pipe is equal to the area of the base times the height. V ≈ 10.21 cm2 · 100 cm V ≈ 1021 cm3. 2. The same pipe is made of a metal alloy with a density of 3g/cm3. What is the mass of the pipe in challenge 1? Answer: Using dimensional analysis, cm3·g/cm3 = gm. So multiplying the two quantities will give the correct result. 1021cm3·3gm/cm3 = 3063gm = 3.063kg. Annulus . www.mathisfun.com. Math Is Fun. 6/19/2018. https://www.mathsisfun.com/geometry/annulus.html. McAdams, David E. Annulus . 4/11/2019. All Math Words Encyclopedia. Life is a Story Problem LLC. http://www.allmathwords.org/en/a/annulus.html. Paper Towel Roll: Santeri Viinamäki, commons.wikimedia.org. This file is licensed under the Creative Commons Attribution-Share Alike 4.0 International license. https://commons.wikimedia.org/wiki/File:Paper_towel.jpg. Tape Roll: BenFrantzDale, commons.wikimedia.org. This file is licensed under the Creative Commons Attribution-Share Alike 3.0 Unported license. 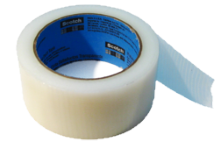 https://commons.wikimedia.org/wiki/File:Transparent_duct_tape_roll.png. Pipe Shape: Fito, commons.wikimedia.org. This file is released to public domain by the artist. https://commons.wikimedia.org/wiki/File:Pipe_shape.png.